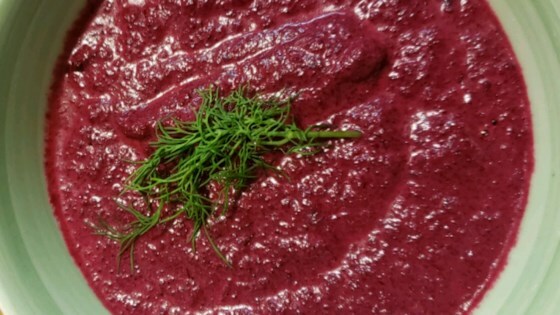 "A pureed vegetable soup can be an impressive, easy and affordable first course for an elegant dinner, or even a light dinner on its own with salad and bread." Heat oil over medium-high heat in a large, deep saute pan until shimmering. Add beets, then onion; saute, stirring very little at first, then more frequently, until squash start to turn golden brown, 7 to 8 minutes. Reduce heat to low and add butter, sugar and garlic; continue cooking until all vegetables are a rich spotty caramel color, about 10 minutes longer. Add caraway seeds and cayenne pepper; continue to saute until fragrant, 30 seconds to 1 minute longer. Add broth; bring to a simmer over medium-high heat. Reduce heat to low and simmer, partially covered, until beets are tender, about 10 minutes. Return to pan (or a soup pot); add enough half-and-half so the mixture is souplike, yet thick enough to float garnish. Taste, and add salt and pepper if needed. Heat through, ladle into bowls, garnish and serve. This creamy soup is made with fresh tomatoes, cream, and butter. *To toast caraway seeds, heat 1/2 tsp. caraway seeds in a small skillet over medium-low heat until they start to gently pop and smell fragrant. Cool slightly, then crush with a rolling pin. Made same as recipe but used coconut milk instead of 1/2 and 1/2 and substituted veggie broth to make vegetarian. Love the dill/beet/caraway flavours! Don't skip toasting the caraway seeds - makes a bit difference to the flavour. Used chevre instead of a boiled egg for garnish. Wonderful soup!